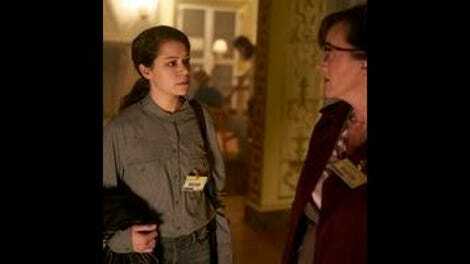 "Let the Children and Childbearers Toil"
Sisterhood between the clones may be a constant refrain on Orphan Black, but tonight’s episode took a step back to reexamine the bonds of the show’s core family, and in particular the skills of Mrs. S. We’ve known for a long time that Sarah is an incredibly talented grifter, and it’s often seemed like part of her earlier life as a selfish con artist. But tonight we got to see the woman who trained her in action. Mrs. S is one of those secondary characters whose backstory, it’s clear, is probably just as fascinating as anything anyone else on the show gets up to. Over the run of the show, we’ve gotten hints of her violent past, her shady connections, and her efforts to distance herself from the person she used to be. She’s the show’s consummate mama bear, fiercely maternal and protective, and ruthlessly violent when she finds it necessary. And here, we get a bit of a glimpse of how she raised Sarah and Felix to be such effective liars. Plus, it’s rare that Mrs. S gets to be in on the caper instead of hanging out in the background protecting Kira. She and Sarah make a forbiddingly effective team in their efforts to steal an ID from Dr. Perkins, from their seamless transition between an actual fight and a (somewhat) staged one to their matched ability to improvise while working their way to Virginia Coady. While the big reveal of Coady makes for a fun guessing game in the moments leading up to it—it was hard not to expect another Leda once S says Sarah will recognize her—it still doesn’t totally make sense for S not to clue Sarah in. Coady imprisoned her and Helena and turned the Castors into weapons. Wouldn’t it make more sense to warn her about what she’s getting into and give her time to prepare emotionally to see someone she thought was dead? Maria Doyle Kennedy has always done a lot with what she’s given on the show, but this is one of the times when the efforts to make Mrs. S as mysterious as possible ends up seeming like questionable plotting, given Sarah’s violent reaction to Coady. The Coady plotline is tied to both of the other main storylines in a way that’s unusual for the show. 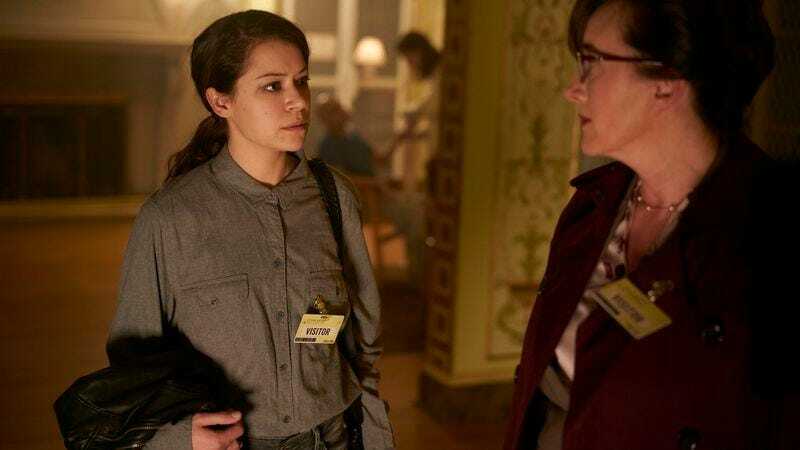 Cosima and Ira are on the same path as Sarah and S, pulling together bits and pieces about the history of the hierarchy and methods of Neolution. Ira’s research is far more genteel, and involves polite conversation with Susan Duncan, while Cosima gets stuck in a horror movie, wandering bloodstained shadowy basements and venturing into the woods at night. It all leads to the big reveal that the Forest Monster is actually an early experiment of Coady, Susan, and P.T. Westmoreland. Given that we’re clearly on the path to getting some answers about the clones, do we need to take a diversion towards a new character? And Adele is back, unexpectedly brought into the fold by Mrs. S because she turns out to randomly have the legal background they need to do Neolution research in…Switzerland? Felix is understandably upset about this, saying it wasn’t their call to tell her the truth, only to be immediately overruled by both his sister and his mother. Only, he has a pretty good point, doesn’t he? She’s his family member, not theirs. Why not at least give him the option of telling Adele himself, rather than surprising him with the result? This way, he’s just another piece to be moved around the game board by Mrs. S, who’s suddenly exerting a lot of control over the plan. It’s rare to see Sarah actually defer to someone else’s judgment on the show. But maybe she’s just feeling unusually good about sibling bonding time after her visit with Helena. That has to be the healthiest Helena has ever looked on this show. There are barely any circles under her eyes! And when she smiles at her sister, it’s somehow the most she’s ever resembled baseline Tatiana Maslany. Despite the reveals that come later about the man in the woods, Sarah’s admission that she finally experienced the psychic connection Helena has always felt seems like the bigger piece of the final mystery. Is this another element of what makes the Sarah/Helena line so special? Not to nitpick, but couldn’t Sarah have washed off her eye makeup before going undercover? It was an odd choice for a nervous research assistant. Speaking of odd undercover choices, why didn’t S rent a car for this excursion? Seems risky to use her own vehicle for this, though it was entertaining to see she’s a bumper sticker aficionado for such important causes as breast feeding and animal rights. Felix calms both Sarah and Kira down by drawing them. Did everyone catch that there was a painting of Sarah visible in the background behind Kira when she said she looked like her mom? The concept that P.T. overvalues ruthlessness is not surprising, but for a guy who’s managed to live as long as he has, it’s hard to imagine that he’d let someone as unstable as Rachel run his operation. The young gentleman added to the lengthy list of easy marks charmed by the clones is played by Varun Saranga, who is also appearing in Wynonna Earp this summer. Kevin Hanchard has also been on it this year. As always, there are like 12 actors in Canadian television. OK, but really, Sarah can’t put together who Mrs. S’s source on the inside of Neolution is? Literally there is one person this could be. As is fitting for a horror movie, Cosima is far braver than any normal person would be under those circumstances. Even after she’s seen the Murder Basement, she goes into the woods! Possibly at this point, she just assumes she’s immortal, given how many times she’s been on the brink of death.